HMS Dreadnought, brainchild of Admiral Sir John Fisher, was launched in 1906. The one thing that set Dreadnought apart was her battery of ten 12-inch guns, of which eight could be fired on either broadside. 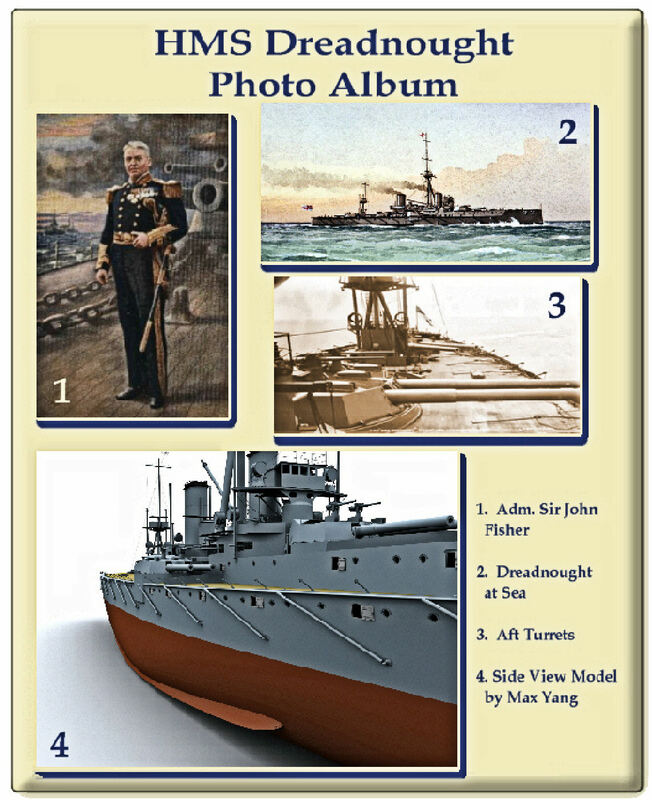 Soon all the major naval powers – and some minor ones, too – were building or buying dreadnoughts, and the dreadnought race between Britain and Germany contributed to the growing tensions between these two nations. When the great struggle finally came, though, Dreadnought was a bit "long in the tooth." By May 1916 she had been transferred out of the Grand Fleet to a squadron of pre-dreadnoughts based in the Thames Estuary. Earlier, however, she accomplished a singular feat. On 18 March 1915 she rammed and sank U-29 [below] in the North Sea. HMS Dreadnought holds the distinction of being the only battleship to sink a submarine in combat.